Tom Sawyer is a great theme for a boys birthday. Mix and match these fun do-it-yourself ideas to make it special for the Tom Sawyer in your life. Listed are great ideas for party games, activities, invitations, decorations, favors and food for a Tom Sawyer party. Make rafts before the party for kids to decorate or let them make their own from popsicle art sticks. When they are dry let the guests race them in a pool or stream. In a pool they can blow on the rafts with drinking straws to make them move. Set up several small wooden rafts made with craft sticks in the center of a kiddie pool. Give the guests pennies and have them try and throw the pennies onto the rafts. Whoever gets the most pennies to stay on the rafts wins. Have a prize for the winner or bundle all the pennies in a handkerchief to give away for the prize. Tom Sawyer loved to fish and this is a fun game for all ages. Instead of fish on the end of their line the guests get small prizes or candy. Make a fishing hole from an appliance crate or simply hang a sheet over a piece of rope or clothesline (just make sure that the person who is in the water giving out the prizes is covered and can not be seen by the children playing the game. Use clothespins as hooks and tie them to string and a fishing pole. Kids put their fishing line into the water and then pull out a prize. Send the party guests on a hunt for Injun Joe's buried treasure. Make a map of your neighborhood or the party area that leads the kids through different places. Hide clues to where they have to search next at every place on the map. At the end of the search for Injun Joe's treasure set up a crate filled with candies and other party favors that the kids can take home from the party. Or you could have the goody bags all prepared and ready for them to take home. Some great old fashioned games that would be fun at a Tom Sawyer birthday party are potato sack races, tug of war and leap frog. Set up the games individually or have teams compete in a relay style race that combines all of them at once. Print information on white cardstock with a graphic of Tom Sawyer, a boy fishing, or a fence being painted and glue it on top of brown construction paper or a heavy brown paper bag. Embellish with twine. Make a small hobo pack invitation by cutting a bandana into four equal square pieces. Print out party information and place inside the bandanas. Tie the ends of the bandanas together around the paper and attach to a small stick or tree branch. Buy or make cards to look like a fence (like the one Tom Sawyer paints) and write the party information on the fence or print using a paint font. Create a southern feel to the Tom Sawyer party by using red and white checkered tablecloths or a more rustic feel with burlap tablecloths. Use tin buckets to hold snacks and give each bucket a small tin cup for guests to scoop out a serving. Tie twine or strips of red bandanas around mason jars and use them to hold silverware and candies. Give each guest a tin cup with their name on it or a mason jar embellished with twine or strips of bandanas tied on the handle or around the top of the glass. Place hay bales, barrels and old wooded boxes, tree stumps, straw hats or crates around the party area. Just as Tom Sawyer painted let the party guests paint a picture frame or a small wooden box. Set up an area with paints, brushes, water and paper towels and a large enough area away from the party to set the painted items to dry. Make the picture frames look like a fence by having the kids glue wooden popsicle sticks on the outside of the frame and then painting them white. Have some of the sticks cut into shorter lengths before the party. 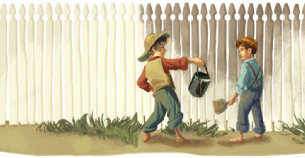 Tom Sawyer was great at painting fences ... let guests try painting their own fences by hanging up butcher paper over a fence and letting guests paint or draw with chalk. Set out lots of craft popsicle sticks and let each guest make their own raft. After gluing them together let them paint and decorate them. If you have access to a pond or pool have a raft race during game time.